J.I. Allison and Joe B. Maudlin share their thoughts on Paul McCartney and the night they heard about the plane crash that killed Buddy Holly. The Crickets will be honored Saturday for their work with Lubbock-born music legend Buddy Holly — who died in a 1959 plane crash — and for their long history since. Drummer Jerry “J.I.” Allison, standup bass player Joe B. Mauldin and vocalist Sonny Curtis will enter the Rock and Roll Hall of Fame. Niki Sullivan, who was with the Crickets in 1956-57, died from a heart attack at age 66 in 2004. The three surviving members continue to tour and perform as the Crickets. No Crickets plan to attend the induction ceremony in Cleveland, which will be videotaped and broadcast in early May on HBO. An interview with Curtis, also a prolific songwriter, was published Feb. 25 in The Avalanche-Journal and can be found with this story on lubbockonline.com. The A-J intereviewed Allison and Mauldin recently, and the first discussion was printed Sunday. Today is the second part and the third on Wednesday. A-J: What do you recall about the time ya’ll were sent to Nashville to record? Allison: Buddy got a contract with Decca after sending some demos to Nashville. I was still in high school and could not leave to do the recording. So it was Buddy and Sonny Curtis and Don Guess who recorded four sides with Nashville players, and we were all excited, waiting for a release. “Blue Days Black Nights” was released and didn’t sell a lot. We went back to Nashville that summer and recorded some more, which sold less. It was my first union session. I had to go to Amarillo to join the union. It was a really neat trip. We met Webb Pierce, Marty Robbins and on and on. We also went to the Grand Ole Opry. Mauldin: I was not part of the Crickets when Buddy and J.I. went to Nashville to record. Allison: 1956, ’57 and ’58 just flew by. We were unbelievably lucky. We started recording in Clovis, Joe B. Mauldin joined the band and Brunswick Records released “That’ll Be the Day.” It started selling a few, and we were booked for a 17-week tour playing with our heroes like Fats Domino, Little Richard, Eddie Cochran, Chuck Berry, and almost everyone else who played rock ’n’ roll. It was perfect. We were having the time of our lives. Mauldin: It did feel like everything was happening super fast. All of a sudden, we were going to be on the biggest show in the business. A-J: Did you feel nervous at all when you went to New York, and all of a sudden you were meeting and making friends with other stars? Allison: We didn’t have time to be nervous on our first trip to New York. I was busy looking up at the tall buildings, and generally being in awe of the whole unbelievable experience. I don’t think the Great Plains Life building even existed in Lubbock back then. Then on the first or second day in New York, we met the Everly Brothers, who are still my favorite singers. We met them on the street, returning from shopping for clothes. After that, we toured all over the United States and Canada with them. In 1959, Joe B., Sonny and I became their backup band, again touring the U.S., Canada, Australia and Great Britain. Mauldin: I didn’t feel nervous, but it sure was fun being able to hang out with the people I had considered superstars for so long. A-J: Surely, you were aware that the Beatles said there would not have been a Beatles without the Crickets coming first? That must mean a ton. Allison: Paul McCartney actually told us, “If not for the Crickets, there would not have been any Beatles.” It was like the ultimate compliment for me. Elvis, the Everlys, the Beach Boys were all fantastic. But then along comes the Beatles and the Rolling Stones to keep the fantastic going. A-J: Is there one thing you remember most about Buddy? Allison: He was my best friend and a smart alek. Mauldin: The thing I remember most about Buddy is that he wanted everyone to be happy. A-J: Have you any thoughts on why Buddy and the Crickets were so consistently loved in Great Britain. It seems like you caught on faster in England than at home in the USA. And it is still happening. Allison: We toured England for a month or so in 1958, and I believe we were the first American rock ’n’ roll band, other than Bill Haley, to appear there. There was a TV show called “Saturday Night at the Palladium” that was very comparable to “The Ed Sullivan Show.” Their show was very popular and, on the night we played on it, the stars were Bob Hope and Robert Morley. It seems like everyone in Great Britain saw that show. It was amazing. A fellow named John Beecher started a fan club (The Buddy Holly and Crickets Society). He now runs Rollercoaster Records, and we’re still in touch. Another friend started a fan magazine (Cricket File). He still publishes it. Between the two, they know everything that has happened as far as Buddy Holly and the Crickets. It’s great that it is still happening. Mauldin: I’m very happy that the fans in England are so true, rather than fickle. A-J: Please share how you found out about the plane crash and Buddy’s death. What was your immediate reaction? Allison: We were living in Clovis at the time and came back home on Feb. 2. The next morning, I was still asleep. Sonny had been sleeping on my folks’ couch and was already awake, talking to my mom. Our friend and neighbor across the street (Oleta Hall) came over and said that she heard that Buddy and the others had been killed in a plane crash. Sonny woke me up immediately. We could not believe it. It’s still hard to believe. Mauldin: I was at my mother’s house in Lubbock when the telephone rang and woke me up. It was my sister, who asked if I had heard that Buddy was killed in a plane crash. I would not believe her for a long time. A-J: You and Joe B. had separated from Buddy for a while before his death. Do you think that ya’ll would have gotten back together with Buddy? Was that the plan? 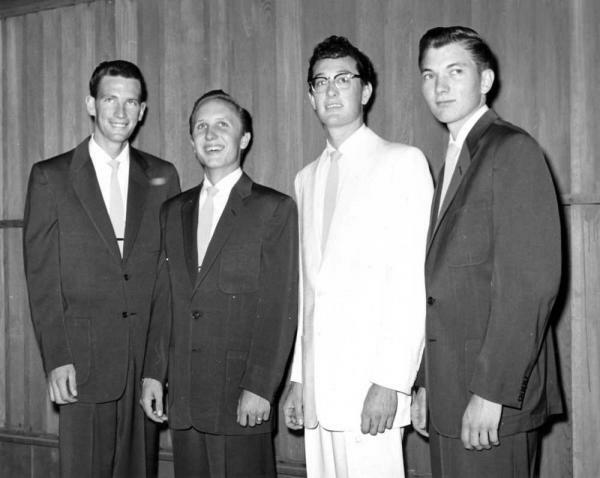 Stopping to pose for a backstage photo in the 1950s are Buddy Holly and the Crickets The band is, from left, Niki Sullivan, rhythm guitar; Joe B. Mauldin, standup bass; Buddy Holly in the white suit, lead vocals and lead guitar; and Jerry Allison, drums. The Crickets will be inducted into the Rock 'n' Roll Hall of Fame in Cleveland on April 14. Bah euhhhh...les Criquets viennent de faire leur entrée au Rock'n'Roll Hall of Fame, et donc leurs membres (Jerry Allison) se rappellent de Paul (dont on sait qu'il est un grand fan de Buddy Holly devant l'éternel) qui leur a dit : "Sans criquets pas de scarabés" !